Back in January, the SequelQuest Podcast did a whole show where they brainstormed ideas for a third Tim Burton Batman movie. It’s a good idea for an episode that led to some interesting discussions and went in a few places I didn’t expect. It got me to think. And think some more. I started to have my own ideas of what a third Burton Batman film would look like so I organized my thoughts in order to write them down. I started talking with CT about this a while ago and we decided to sort of do this together. I would put my ideas up here and he’d put his over on Nerd Lunch. I don’t know a lot about his idea, I’ve only gotten small bits and pieces so I’m excited to hear what he has to say, but before you head on over there, let’s take a look at my ideas. Before crafting a new Burton Batman movie, there are things to consider. Do you ignore the Schumacher films and create your new Burton film back in the mid 90s? Or do you have Burton create the film now revisiting his characters from the 80s-90s? I think CT went with the former. I’m going with the latter. For my story idea, this movie would be released in modern day. The events in this movie would be a sequel to Batman Returns and ignore both Batman Forever and Batman & Robin. I’d love to get most of the crew from the 1989 movie to return with Burton. Michael Keaton would return to the role of Bruce Wayne/Batman. Danny Elfman would score. Obviously I’d love to go back to Anton Furst to redesign his “Hell on Earth” Gotham City but unfortunately he died back in 1991. No slight to Sam Hamm or Warren Skaaren (who died back in 1991), but I think I’d like to get newer, more modern writers to translate my ideas to the silver screen. Maybe the Duffer Brothers (Stranger Things) would be a good nostalgically modern choice for writers. All that being said, let’s talk about my story idea. The title of my project is Batman Redemption. Like I said, the story takes place modern day. Keaton is an older Batman. He is wrestling with the fact that he doesn’t want to be Batman anymore. He finds he’s losing interest in the constant fight and bandaging old wounds. Alfred is dead. Selina Kyle has either died, or she dies in the cold open of the movie. Bruce is essentially alone being Batman and living in Wayne Manor. He decides that it may be time to retire. He’s just not sure how to do that. He’s rudderless. He goes through the motions of running patrols in the evenings. He doesn’t know what Gotham looks like, or Bruce Wayne, for that matter, post Batman. Suddenly, a rash of violent crimes start occurring. Unexplained crimes. Crimes that have a familiar look and feel. Clown based crimes. It sort of shocks Bruce out of his melancholy. He suddenly has a purpose. Is the Joker back? Is there a copycat? Bruce obsessively studies the crimes looking for clues. Without Alfred there to rein him in Bruce pushes himself to the limit trying to figure out if this is the real Joker or not. It couldn’t be possible though, right? The Joker died. He fell from the top of Gotham Cathedral. We get to see a lot of Bruce Wayne in a scarf and trench coat, walking the streets of Gotham like we saw him do so many times in the 1989 Batman movie. He’ll go to Gotham Library and start looking at old newspaper headlines on a bunch of microfiche film. Then back to walking the wet streets of Gotham. While all of this is going on the clown crimes continue. On one of Bruce’s sojourns he comes face to face with Nicholson’s Joker. He’s back. Bruce is caught flat footed. “Jack? You’re dead!” The Joker maniacally answers, “Sorry, Batsy, the man who laughs lives and I’m back to put a bee in that little bat bonnet of yours! HAHAHAHAHA!” Bruce is swarmed by creepy clown mimes and starts to fight back until he realizes he’s Bruce, not Batman, and out in broad daylight, so he stops fighting. The clown mimes clear out and Bruce is again alone on the streets. The Joker begins establishing himself as the new crime boss of Gotham. We see him pulling off murderous pranks, killing city officials. All the kooky antics we remember from 1989. We see his hideout in the old abandoned Axis Chemicals building. We make sure to focus a lot on the Joker and his thugs as they run rampant through the Gotham criminal underworld. We see Joker joy buzzer electrocuting and whoopie cushion exploding all the crime bosses in Gotham who refuse to follow him. Lots of kooky kills for Joker, including killing his own crew when he feels they’re “cooling off his casserole”. There will be lots of random, weird metaphors by Joker. Meanwhile Bruce is baffled how Jack could be back. Bruce has to go out as Batman and track down the cops who worked the morgue that night the Joker died, trying to pin down what exactly happened after he fell off the tall, gothic church. Bruce discovers that Joker’s body actually disappeared sometime after it had been taken to the Gotham City Morgue but the disappearance was kept silent. Batman confronts Gordon about it, but discovers he didn’t know either. All the while, Batman is constantly mocked by Joker at every turn. Bruce continues to be one step behind him. Bruce pieces together some things but remains unsure of the whole story of Joker’s return. He has a few more run ins with the Joker and eventually finds himself captured by the Clown Prince of Crime and awakes inside his headquarters. It’s here, through an elaborate flashback, we learn what actually transpired that night as Joker can finally “reveal it all” to Batman. We see the final minute or so of the original Batman 1989 climax scene, Joker’s fall, then the pan out of the “dead” Joker with the laugh machine. Then, the camera, stops, and pans back down closing in on Joker as we see mysterious men enter the frame and drag the Joker’s body away. These mysterious men keep him alive as they take him to a secluded building on the outskirts of Gotham where he is prepped for travel. Back in Gotham PD headquarters, officials in the morgue on Joker’s new benefactor’s payroll place a body double in the drawer with paperwork saying it’s the Joker. There is so much going on that no one is able to double check. Then later, the appearance of Penguin and Catwoman would further obscure the body switch from the proper authorities. Meanwhile, Joker’s actual body is again transported, this time to a secluded temple in the middle of nowhere. At this point Joker is still alive, but only barely. He meets a very beautiful but severe looking woman surrounded by a bunch of scary looking thugs. The woman introduces herself as Talia (played by Eva Green). She has a proposition for Joker. He’s dying. Quickly. But she can save him, if and only if, he helps her with a little problem she’s having. Joker agrees because he’s got nothing else to lose at this point, so Talia’s men carry Joker over to what looks like a hot spring filled with a softly glowing sludge. He at first is scared, worried they are throwing him into radioactive waste, but once submerged in the glowing sludge, the “pit” begins reviving him. Joker comes out of the pit whole, and possibly even a little crazier than he was going in. Talia explains that her father has plans for him. Joker asks, “Do they involve a certain 6 foot Bat in Gotham City?” Talia just smiles. Cut to a shot of Joker laughing maniacally. Ultimately, the climax is Batman fighting Joker and Talia. Batman learns during the climax that it was Talia who ordered Selina’s death and it was Joker who killed her. The climax may even take place in the aforementioned secluded temple with the Lazarus Pit, which I don’t plan on even mentioning by name. It’ll be just “the pit”. I imagine at some point, while fighting Talia, that Batman will be flung into the pit. Batman doesn’t know what it is either, so he quickly climbs out. The quick submersion, though, winds up reviving him and helping him to win the climatic battle. The submersion in the pit would also renew his passion for being Batman and continuing the fight against evil. Ra’s al Ghul is a presence, but will essentially be the Darth Sideous of this movie. We may not even see him. At the most, we would get a quick scene of him talking to his daughter. Maybe. At the end of the movie Joker is defeated and more than likely killed. Again. Talia will escape to possibly return in another sequel. And that’s my Tim Burton Batman sequel. Talia seemed like the perfect “Burton babe” to use in this sequel. Plus I wanted to bring back Joker and the Lazarus Pit is the perfect way to do that. Hope you enjoyed this pitch, remember, head on over to Nerd Lunch to check out CT’s pitch called Batman Continues. So, as you know, I love movie novelizations. I read them. I collect them. I review them. I talk about them on a podcast. I love reading and talking about novelizations with people. It gives me joy. Being so steeped in novelization lore, there are times I’ll be digging through book stacks at a used store looking for novelizations and see something that makes me say, “THAT got a novelization? !” Then I stare at this oddball movie novelization and wonder why *that* got a novelization but not some other cult movie I’m very fond of. It happens more than you think. It’s at these times that I lament these missing novelizations and so I decide that they *have* to exist so I need to create them myself. Well, I need to create the cover, I don’t actually go out and write the novelization. However, I won’t lie, the thought of actually writing a novelization *has* crossed my mind. Shawn Robare and I have talked about it several times. I’d totally do it for something like Young Guns or Krush Groove. Anyway, back to the covers. One of the very first novelization covers I created myself was for Young Guns II. I did it with the aforementioned Shawn Robare who created the novelization for the first Young Guns movie. We had so much fun planning out those covers and also creating vintage Young Guns trading cards that I wanted to do more. Then I created the cover to a Krush Groove novelization which was pretty dope. Then, in the official first installment of this “Should Exist” series, I created Mario Puzo Superman novelizations as well as Breakin’ novelizations. These continue to be really fun to do, guys. I want to make more. I actually made a bunch of these covers but I’ve been lax about putting them out there. Well, a few days ago, a few of us over on Twitter were bandying about as we are want to do and we created a bunch of faux novelization covers on the fly. CT over at Nerd Lunch created a pretty awesome Xanadu cover. 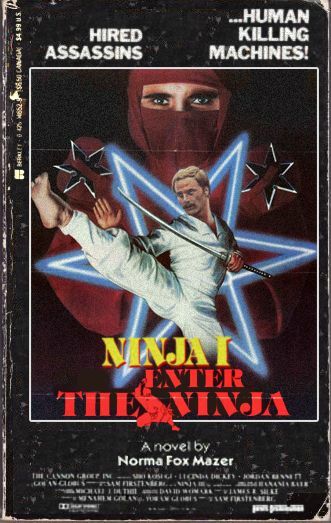 And someone requested that we do a Ninja III novelization. Funnily enough, I already had plans to do that one so I cobbled it together. Here it is. I love this movie and I really wanted to do it justice. I picked Norma Fox Mazer as the author because she had written the Supergirl novelization the same year as Ninja III was released, 1984. I figured, strong female protagonist in both, Mazer would be great. If Mazur is too busy my second choice would be Leonore Fleischer, the queen of the movie novelizations. Now, as I finished this I realized, I’m going to have to do the entire Canon Ninja Trilogy, right? There’s no getting around it. So my wheels started turning. I started thinking that I wanted all three covers to…somewhat…match. But does that make sense? The previous movies came out in 1981 and 1983, so how could they really look similar? Then I started thinking about Friday the 13th. Back in 1986, Simon Hawke novelized Friday the 13th Part VI: Jason Lives. That novelization was popular enough that the studio commissioned him to go back and novelize the first three movies in the franchise. So Parts I and II were novelized for the first time in 1987 and Hawke re-novelized Part III as well (it was the only film that had been novelized previously). 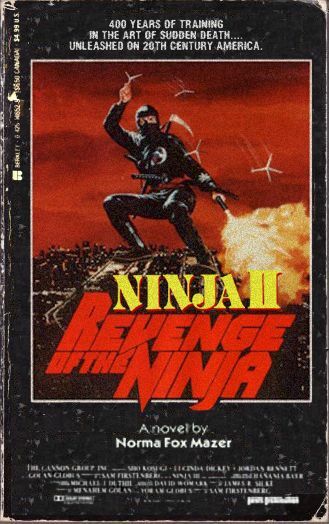 So, using this model, I decided that Canon was very happy with the novelization that Mazur turned in for Ninja III, so they commissioned her to go back and novelize the first two movies as well; Enter the Ninja and Revenge of the Ninja. And here they are. Click to see either of these bigger. And the plan is that they’d all be released around the same time which would mean they all get matchy-matchy covers and this would also publicize the older movies a bit as well. And as you see, I wanted to play up the fact that these are all part of a “series”, so I added the Ninja I and II titles. And here is the full set of Canon Ninja Trilogy movie novelizations in all of their glory. Click it to see it BIGGER! I have more of these to come. So stay tuned.